Ghana has declared 2019 as a Year of Return, inviting the global African family to a birth-right journey home to the country. At a colourful launch event at the National Press Club in Washington DC, The President of the Republic, Nana Addo Dankwa Akufo-Addo, says the time has come for people of African descent to make the journey back home and says Ghana has opened its arms wide to welcome its brothers and sisters. According to President Akufo-Addo, Ghana’s Pan – African leadership and legacy status was earned not by coincidence but by a conscious effort by the country to validate the struggles, strengths and links between African descendants on a Pan African scale. The President noted the Galaxy of African American intellectuals, leaders and creative professionals like Martin Luther King Jnr., WEB DuBois, Maya Angelou, Stevie Wonder etc who have honoured Ghana by their presence and have in turn been inspired by Ghana. He said never again should Africans allow themselves to be enslaved. The President paid tribute to the late Jake Obetsebi Lamptey who more than a decade ago launched a “Joseph project” to reach out to the African diaspora. The Year of return is the only Centrally organised public- private partnership by an African nation to commemorate the quarter centenary of the arrival of Africans to the United States. 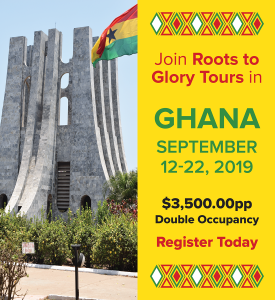 The Ghana Tourism Authority under the auspices of the Ministry of Tourism, Arts and Culture is coordinating the year-long calendar of activities in partnership with the Office of Diaspora Affairs at the Office of the President, the Panafest Foundation and the Adinkra group. The Minister of Tourism, Arts and Culture, Hon. Catherine Afeku, says the launch event marks the beginning of an entire year celebration of the resilience of the African spirit and said her Ministry is working with other public sector agencies to make the return journey easy and seamless. She said, the recent passage of an Act by the United States	Congress, H.R. 1242 – 400 Years of African-American Experience Act is a historically significant milestone and presents a unique opportunity for Ghana. Ghana has over the years maintained a focus for millions of African descendants reacting to their marginalization by tracing their ancestry and their identity. Present at the event were members of Congress, business and religious leaders, Ministers, representatives of the various Ghanaian associations among others.